Digitally Mastered Barred Owl Sounds. 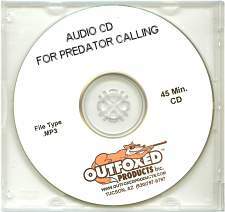 Ideal for calling owls and also for locating turkeys. Plays in any audio CD players. 4 tracks of realistic fawn and doe bleats effective for attracting both bucks and does. All sounds are continuous with some small pauses. 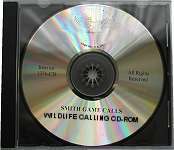 Works with all types of wildlife CD players as well as standard CD players. Continuous aggressive antler rattling effective for calling in all whitetail deer, especially rutting bucks. Running time: 1 hour 18 minutes 45 seconds. Aggressive antler rattling effective for calling in all whitetail deer, especially rutting bucks. This is the same as DT510 except that it has 10 minute pauses between rattling sequences. This enables hunters with CD players which do not have remote controls to place the player away from the stand, giving you hands-free operation. Running time: 1 hour 16 minutes 21 seconds. Digitally Mastered Great Horned Owl Sounds. Ideal for calling owls. Plays in any audio CD players.